I got some great stuff to review recently from @outsidepr and I can't wait to share my experiences with them. I'm always excited to get new running things to try out. How about you? Thanks Spencer for sending out the care package! As most of you are aware, I'm only writing race reviews on new (to me) races that I run this year. This was my second race this year. Overall, I had an awesome time running this fun race. I had to do it since it's only once every four years so didn't want to miss out and wait that long. Great sweatshirts, awesome medals, well organized. I headed up to Road Runner Sports in West Bloomfield to pick up my race packet the Saturday before the race. For those that don't know it, Allen Whitehead who runs the Kona races, also owns these stores in West Bloomfield and Canton. You could pick up your packet at either location. Road Runner Sports - nice store! The store itself had a great selection of shoes and apparel. 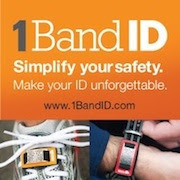 You could even test out shoes and get fitted with their system. Marcela and Greg were working this location. Greg is the race director for this race and an awesome guy who times many of the races in the area. It's nice they knew me and I was in and out in a manner of minutes. Really easy to get your packet. Greg and Marcela working hard! The race was on Monday evening, of course, which was February 29th. It was quite a drive for me to get down there but it was completely worth it. The race was located at Willow Metro Park. It was the first time I had been to this park. I got there pretty early and the race was setting up. As it got closer to the time to race, people started to line up for the bathrooms. The race had the medals all set up and ready to give out. Sweet medals! They glow in the dark! It was not cold at all but, if it were, you could stay inside where they also had packet pickup going on as well. You could have easily picked up your packet race day but I always like to get mine ahead of time in case I'm running late. I like they had both options for pickup. Before the race, many runners were hanging out by the start/finish line waiting to run since it was not really cold - at least for February. I talked with several people that I knew while we waited. 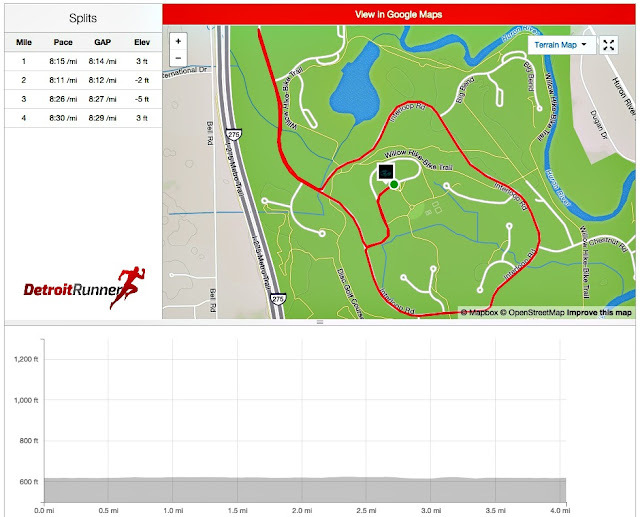 The course itself was pancake flat. It was an out and back for the first part and then a loop around back to the start. Just over 4 miles. I had planned to try and run this a little harder than my training runs have been. I needed to watch as my knee had been giving me issues but 4 miles on cement was okay for it so things worked out. I slowed a little as I got to the finish but that wind at the end didn't help. The race started about 15 minutes late. I'm not sure what the hold up was other than they were waiting for it to get a little darker out and get all the runners in place. We were certainly ready to race. While we were delayed, the race announced that Greg, the race director, had had a heart attack the day before and so his friends all came together to keep the race going. Wow!!!!! That was terrible news but awesome to see people come together to make the race happen. Fortunately, Greg was going to be alright and everyone was very relieved, including myself. It was a non-dramatic start with the race announcer yelling "go!" and we were off. Keep in mind that this is not like your typical race review for me. I usually have tons of course pictures, however, it was dark so the pictures are very limited. I was surprised to see some of the runners didn't have headlamps. It got dark in a hurry and you really needed one. Most of the pictures I took, I stopped to try to get a clearer picture. I had missed the one mile mark but got a picture of the 2 mile. By this time, it was really dark out and you could see some of the runners lights. It's actually really fun to run in the dark for a race. Soon we were at mile 3. At about 3.5 miles, the wind really picked up for the rest of the race and we had a strong headwind until the finish line. Overall, a very nice run and the distance was spot on! No aid stations on course, however, there was an aid station at the finish area. Steve and his wife Theresa were there working the water station at the finish area. I talked briefly with them before heading home. After we finished, the race had food set up inside where packet pickup was located. They had cookies, bananas and various other snacks. They also had extra glow sticks and rings and I picked one of each for my kids. 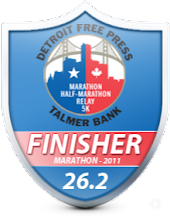 For your race entry of $28 (plus $2.95 processing fee), you received a measured and semi-closed course. You received a custom race bib with a QR code on the bib. You also received a glow ring and sticks as well as a nice sweatshirt and a really cool medal. I personally thought it was a great value for what you received. The sweatshirt was a nice change of pace from a race shirt. I like having different stuff since I have so many race shirts. The finishers medal was awesome! It had a custom ribbon but the really cool part was it was glow in the dark. 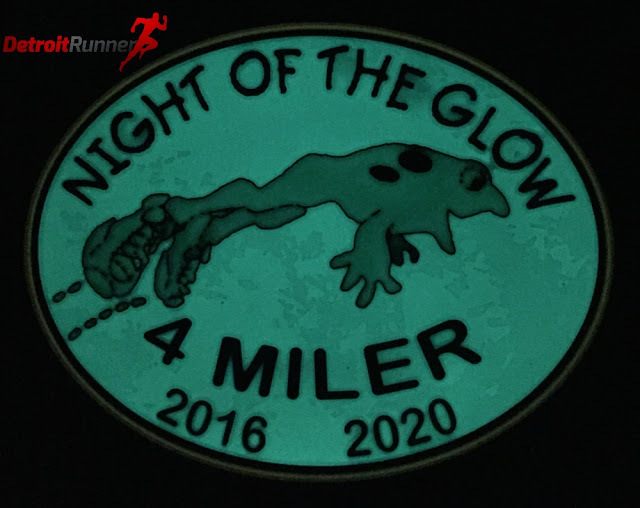 This is my first race medal that glows in the dark and one of the reasons I signed up for the race. What a great idea! Overall, the organization of the race was great. Signing up online was easy. Packet pickup was really easy and nice to have choices. The race was easy to find with good information on their website. The course was well planned and easy to follow. All that and the race director was not even there race day! 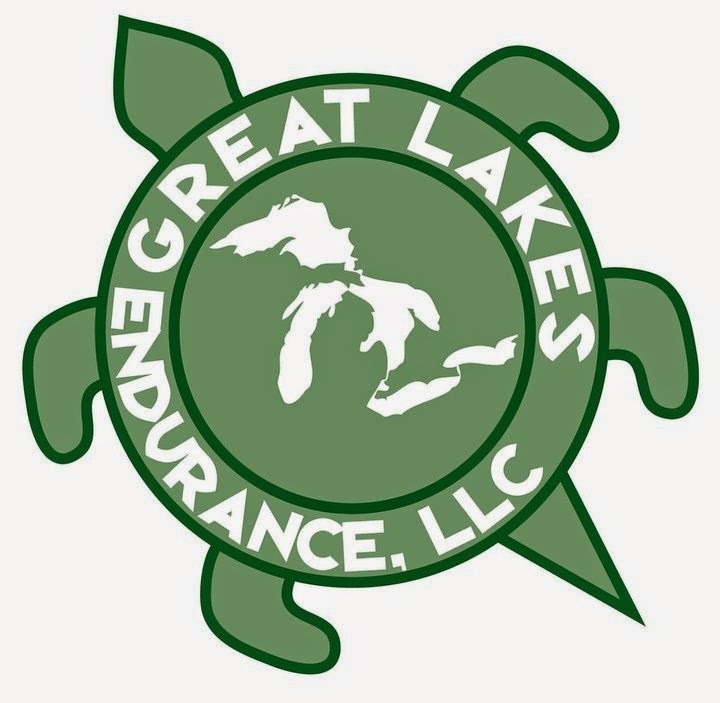 While the race started late, I have to give kudos to the volunteers in keeping the race organization near perfect and I have no doubt had Greg been able to be there, it would have been perfect. Overall this is a race I would do again. Too bad we need to wait 4 years to sign up for it but that is one of the appeals to the race. Not only was the organization good but the race did a great job on everything. From the packet pickup to the race distance to the awesome amenities. This is one race to put on your list. On a personal note, I'm really very happy to see that Greg is going to be better. I imagine, because he is a runner, it likely saved his life. He's made a huge difference in the running community and I'm glad he will be with us to support area runners for many years to come.